The new Queen's Quay multi-use path launched on June 19. Photo by Claire McFarlane. Among the most notable developments on the list are east-west additions to the city’s cycling grid, such as extensions to the Richmond and Adelaide bike lanes taking them east to Parliament Street. The public works committee recently approved this extension. You can read the city’s report on this new cycle track here, and fill out a survey about what you think of the new Richmond-Adelaide cycle track here. City Council is expected to approve the extension in council on July 7, which went through PWIC on June 17. Richmond bike lane (when it was newly installed) at John - photo by Jenna Campbell. Cyclists can also expect improvements to the Harbord Street bike lane as well as a new lane along Hoskin Avenue this year. 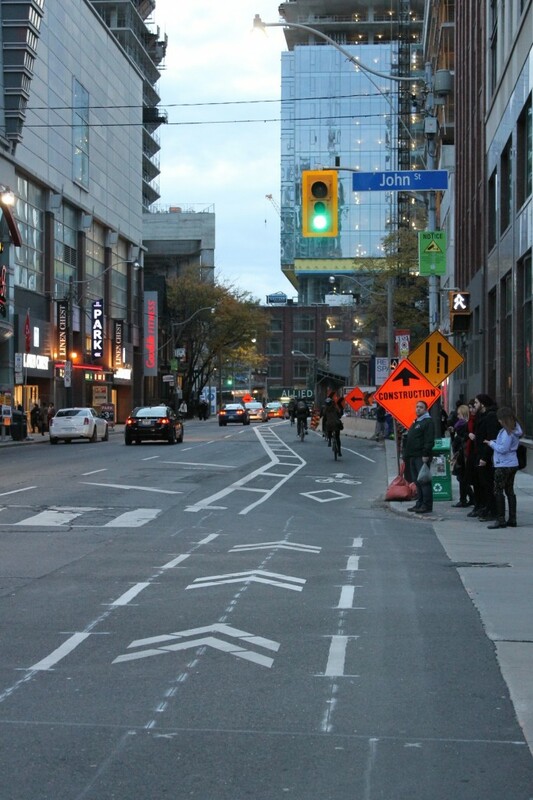 Unfortunately, Hoskin has been closed to accomodate the Pan Am Games -- and the city is not providing any alternative to this extremely busy bike lane (about 4,000 cyclists per day) that provides an important east-west connection for tens of thousands of cyclists that use it every week. Downtown Toronto cyclists are also enjoying upgraded waterfront access, with new cycle tracks on Lower Sherbourne Street and down Bay from Front Street to Queens Quay and the Martin Goodman Trail, which recently received a significant makeover in time to accomodate the expected extra traffic for the Pan Am Games. 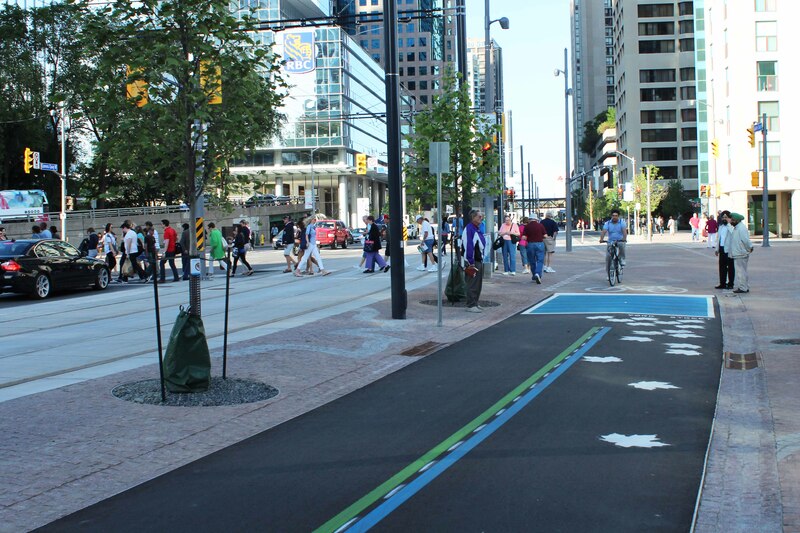 As well as these new additions to Toronto’s bike lanes, bringing downtown one step closer to a complete cycling network, the city is currently developing a 10-year plan for cycling infrastructure. A sequel to Toronto’s 2001 Bike Plan, the 2015 Cycling Network Plan will outline the city’s cycling priorities for the next decade. While formulating this new bike plan, the city is seeking the input of Torontonians via an online survey that weighs options such as strengthening the current downtown cycling network or expanding the network north of Eglinton. According to the survey, developments to the city’s cycling grid will come in four ways: standard bike lanes, protected cycle tracks, sharrows and off-road bike paths. Regardless of how the city chooses to expand or bolster the current network, Torontonians can look forward to seeing more of these four elements in coming years. 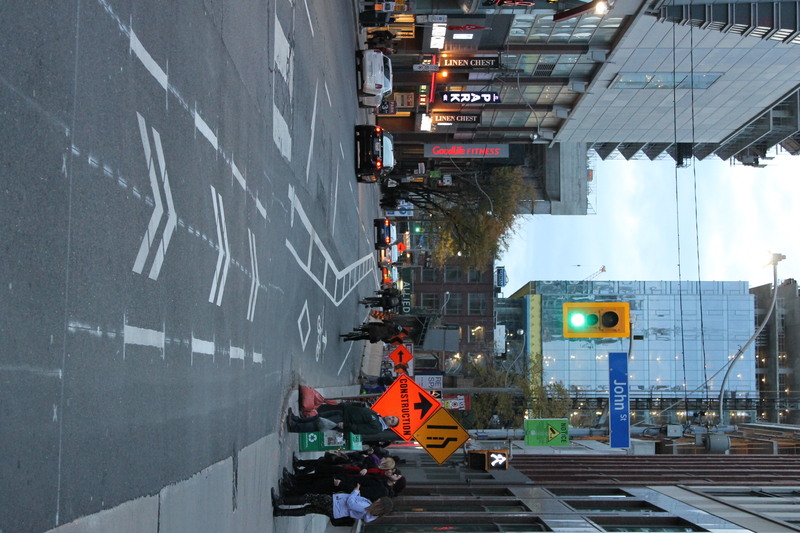 There is overwhelming public support for a bike lane pilot project on Bloor -- but the latest news on that indicated that we won't be expecting that until 2016. 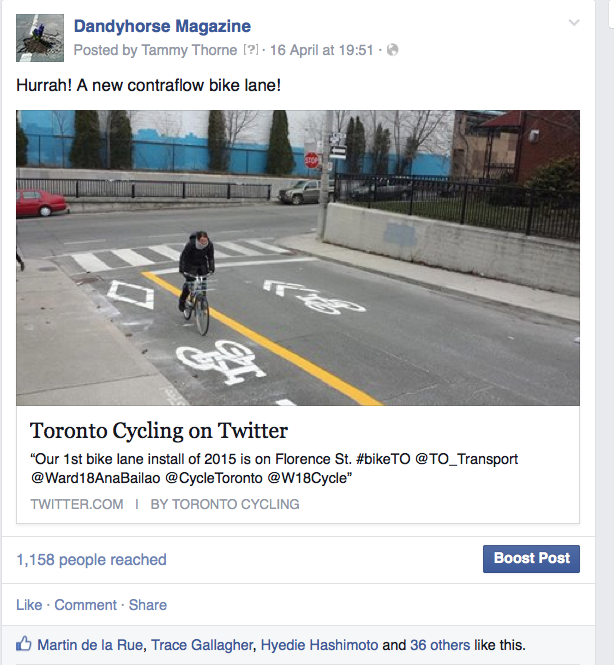 The only new bike lane officially installed so far this year is a contra-flow bike lane (seen below via a FB post from the spring) on Florence in Parkdale. The Queen's Park Crescent bike lane was installed last year and is open, but no official announcement has been made to our knowledge... possibly because the connection lane -- Hoskin -- is being shut down for the summer for the Games. The new issue of dandyhorse is here! Pick up a free copy on July 3 at Urbane, Sweet Pete's, Bikes on Wheels and Hoopdriver. You can buy it online here and at these independent book shops.